Most rust-belt cities are rebranding themselves with all sorts of green/sustainable accolades lately. Modest accomplishment is trumpeted with loud fanfare. Amid this greenwashing, city councils jubilantly downplay the harm remaining heavy industries cause. Usually, they pretend they don’t exist, or that JOBS are more important so go back to bed, pollution isn’t that bad. This deception proves effective: people often don’t believe Portland, Oregon was recently ranked the 3rd most polluted American city. Detroit has never really downplayed it’s pollution. Romanticized are the endless hollow shells of factories crawling with Ruin Tourists eager to photograph these monolithic hulks of brick and steel; irrelevant is the contaminated soil they occupy. Few of these structures are safe to explore, but nobody cares much. They’re empty of workers, full of graffiti, and part of the new Motor City zeitgeist drawing in the Canucks and Aussies. 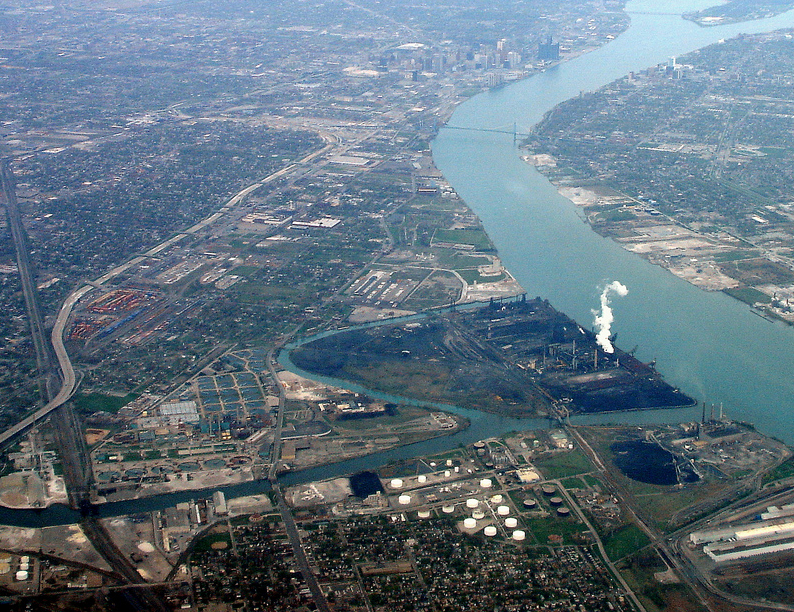 But just south of Detroit, surrounded by a man-made moat, there resides a fully functional black tumor of heavy industry that scorches the land, sea, and sky like some Mad Max/Matrix crossover nightmare. Pictured below is the mysterious, highly guarded, Zug Island. 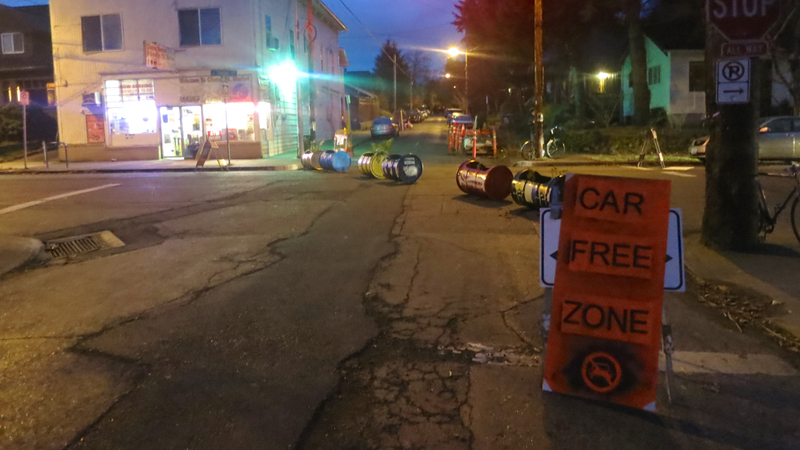 Tactical urbanism, also known as guerrilla urbanism, is a practice that’s garnered increasing interest in recent years. Most of us are so used to authorities shaping the physical space in which we live. The idea of individuals altering streets and buildings to their own desire seems almost taboo. Some frustrated with this stagnation of bureaucracy have taken direct action. They’re redesigning urban landscapes, and thereby asserting their right to the city in the process. An empowering example of this happened last year when the New York group Right of Way illegally installed slower 20mph speed limit signs, effectively making streets safer. Authorities predictably removed them, returning these streets to their prior more dangerous state. 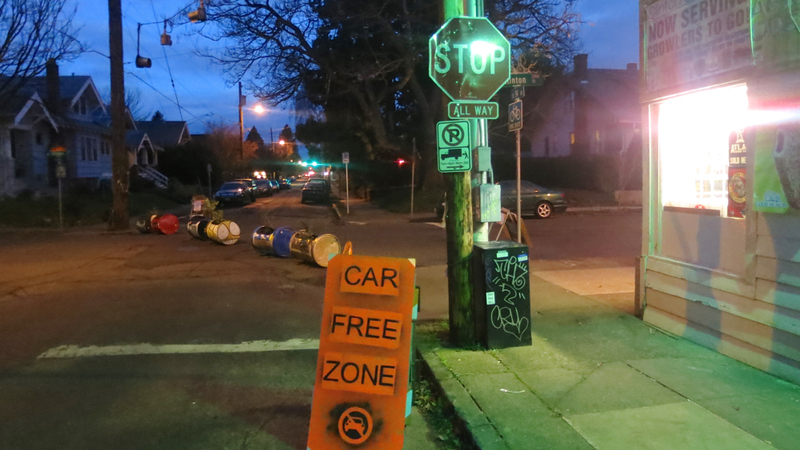 Portland, Oregon is suffering its own livable street stagnation. The number of people cycling as their main mode of transport has plateaued at a mere 6% for years. Politicians here are reluctant to even say the word ‘bike’, much less extoll the numerous virtues of promoting more city folk riding. Nowhere has this stunting become more evident than on Southeast Clinton street. For months, ongoing condo construction on nearby Division street has pushed high volumes of motorized traffic onto quiet Clinton. This street is part of the city’s Neighborhood Greenway network, also known as ‘Bike Boulevards‘ for those unafraid to say the word. Clinton is a great street to ride, or at least it used to be. With the onset of so many more cars, an activist group calling itself Bike Loud PDX came together to push the city to solve this problem. 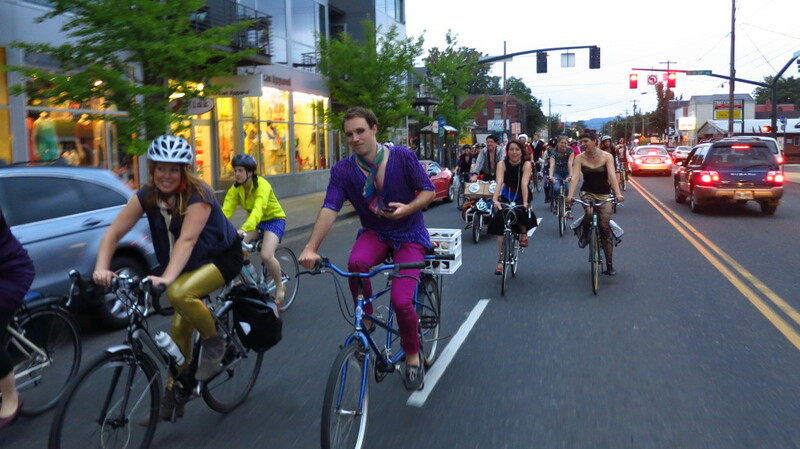 While Bike Loud has legitimately pressed the Clinton issue, their methods fall well within the confines of acceptable discourse typical of Portland politics. Some people, apparently, felt more needed to be done. 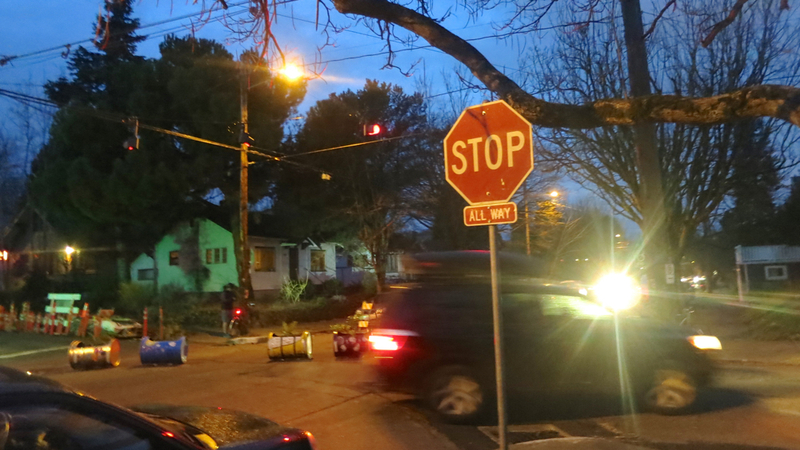 I was riding in to work last Wednesday just prior to sunrise when I came upon something of an art installation arranged diagonally across the intersection of SE 34th ave and Clinton st. There sat six decoratively painted steel barrels, legs welded on the bottom, their top sides cut off and filled with dirt sprouting small green plants.